Pine Log is located in northern California east of Modesto. It is just outside of the old mining towns of Sonora and Columbia on old highway 49. This rich mining camp is on the South Fork of the Stanislaus River, which winds through the Sierras. Gold was first discovered here sometime in 1848 and 1849. This is the area where the big gold rush all started, hence the '49ers'. Pine Log is situated on the river between two very steep, precipitous, rugged, V-shaped mountains that rise several thousand feet almost straight above it. Pine Log was the only level stretch of ground by the river for several miles in either direction. During the summer and fall, shallow water made the location a natural crossing site, and was known that two huge pine logs served as a bridge to cross the river. As early as August, September and October, 1848, many prospectors had worked the banks of the Stanislaus River with good results. By March of 1849, the Stanislaus was almost entirely overrun by all kinds of nationalities. Between August, 1848 and October, 1849, Indians, Mexicans and Americans had either used the Pine Log trail or prospected the area. As time passed and more prospectors got the 'gold bug' with visions of hitting the Motherlode, a town sprung up at Pine Log. Repots of February, 1850 showed that the river camp consisted of a trading tent, eating tent, gambling tent and a few miners tents nestled among the pine trees. The miners did their best to work the river bars, but because of high waters, at times, they had to abandon their claims. High water was only one of the problems they faced. So daring were the Indians, who repeatedly raided the camp to steal the miners cattle, the miners had to work with their rifles at hand. In 1853, John Wallace, of the Tuolumne County Water Company, drew an accurate map of the area. At Pine Log it showed 12 wooden dwellings on the west side of the river and four on the east side. In September, 1853 Pine Log probably reached its zenith. According to the Columbia Gazette, James "Yankee" Sullivan fought E. Hopkins before thousands of excited fans. The next week the Columbia Gazette reported the miners were 'reaping a rich reward' and that several claims were paying from 1 to 4 ounces of gold per man per day. The Columbia Gazette, on September 23, 1854, gives this interesting account. "At Pine Log, on the Stanislaus, the miners are busily at work & doing well. Crowds of miners are there, and the place is lively and interesting. Littlefield & Co. have just struck some rich spots prospecting as high as $8 to the pan. It is supposed that they have the best claim on the river...The water is very low...and if the rains do not interrupt them, they will make a golden harvest." Mining laws at Pine Crossing were adopted on Saturday evening, April 19, 1856. The miners and residents of the Pine Crossing District met in order to adopt a declaration of the boundaries of the district, and to enact new laws in respect to bank and bar claims. It was further enacted that all "bonafide claims in bar diggings, where the pay dirt runs deep, and they are troubled to work them on account of much water," could be laid over from December 1 to July 1, providing the claims were "well defined by marks and notices." Claims were limited to 100 square feet, "laid off in a square." Only one claim could be owned by right of possession, but more could be owned by right of purchase provided they keep men at work on them. Each person holding a claim had to "work on it one day in three or employ a substitute, otherwise such claims shall be forfeited, unless specified"-too much or too little water. The richest golden rewards unearthed at Pine Log, according to newspaper accounts, occurred early in 1857. On April 4th, three miners from Columbia, using two sluice boxes, washed out 30 ounces of gold in three days. Two weeks later, five men sluiced out 15 pounds "of pure gold dust" in the course of one week. So rich was the claim, that two pounds of nuggets were picked out of the top dirt in the sluice box. Disaster struck in mid-January, 1862. The Daily Alta reported that the "thriving little settlement of Pine Log Crossing...was all washed away" by the onrushing flood caused by a vicious rain and wind storm. At the time of the destruction, the town consisted of a "store, saloon, blacksmith shop, eight or ten private residences and a good deal of mining property, all of which was destroyed." In little more than a decade, the little mining camp of Pine Log "panned" and "sluiced" quite a story. 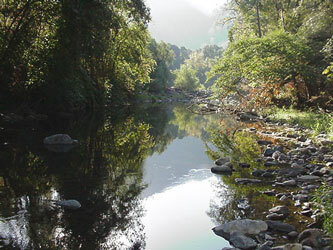 The two huge pines that crossed the South Fork of the Stanislaus made the settlement an important junction for prospectors searching north of Columbia and Sonora. Along with the miners of Experimental Gulch and Italian Bar, the Pine Log miners dug up approximately three and one-half million dollars worth of gold during its lifetime. For a river bar, it was quite rich, and attracted thousands of miners over the years. After the disastrous flood of 1862, miners continued to return to the level clearing on the river. We, as hobbyist prospectors today, are very fortunate that this area has been preserved as a recreational paradise. I was fortunate to participate in the "Motherlode 2000" expedition and will have fond memories of the other prospectors I met as well as the trip back into history! If you have a yearning for the out of doors, rugged terrain, and the excitement of finding one of mother natures most sought after minerals "GOLD", you should contact the Gold Prospectors Association of America www.goldprospectors.org/. You will meet some of the greatest people and have the time of your life! Now that you have received a little history of the Motherlode and Pine Log, check out the pictures of my adventures.